Put 225g raisins in a bowl. Brew 300ml strong tea and stir in 75g organic Australian eucalyptus honey, (a buttery honey with hints of toffee which complements the raisins). Pour the sweet tea over the raisins and leave to soak for 2 hours. Stir 2 lightly beaten medium eggs into the raisin mixture. 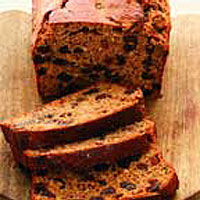 Mix 275g wholewheat flour with ½ tsp ground mixed spice and 1 tbsp baking powder and add this to the raisin mixture. Transfer to a greased 900g loaf tin and bake at 180°C, gas mark 4 for 1 hour, 10 minutes or until a skewer inserted into the cake comes out clean. Cool on a wire rack. Serve sliced and buttered.